Back when I announced that I was participating in the A-Z Challenge, I said there might be bears. I didn't really mean to say this. I just sort of typed it, and then I thought, "except there probably won't be bears," but I didn't bother deleting it. 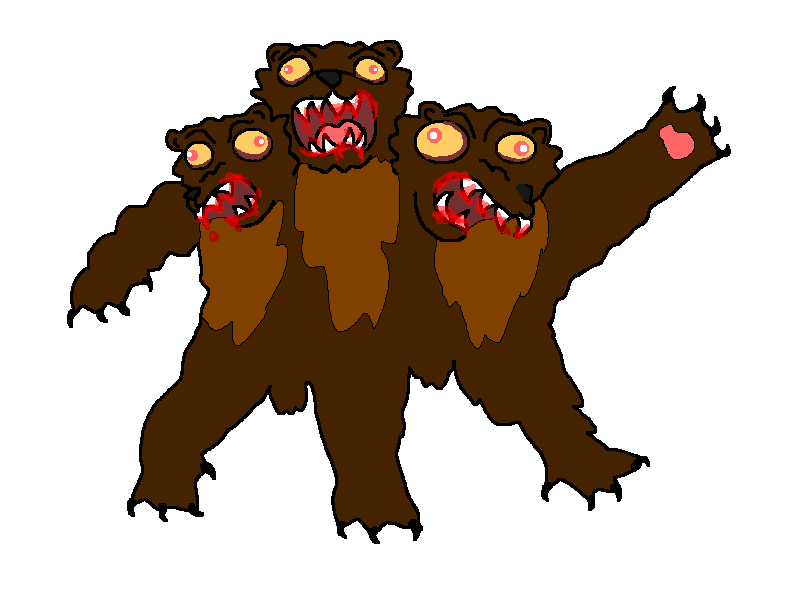 Then, when I posted the announcement on Facebook, I made it even harder for myself by making them mutant zombie bears. Well, Hubs, I already HAD an idea for an "M" topic, so I'm sneaking this in as my "I" post instead. See what I did there? Now I feel like I need to deliver this promise of mutant zombie bears. 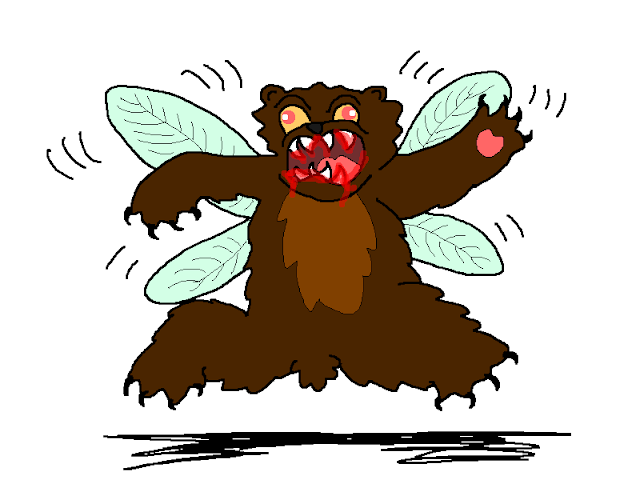 I also can't stop thinking about what the hell a mutant zombie bear is, exactly. 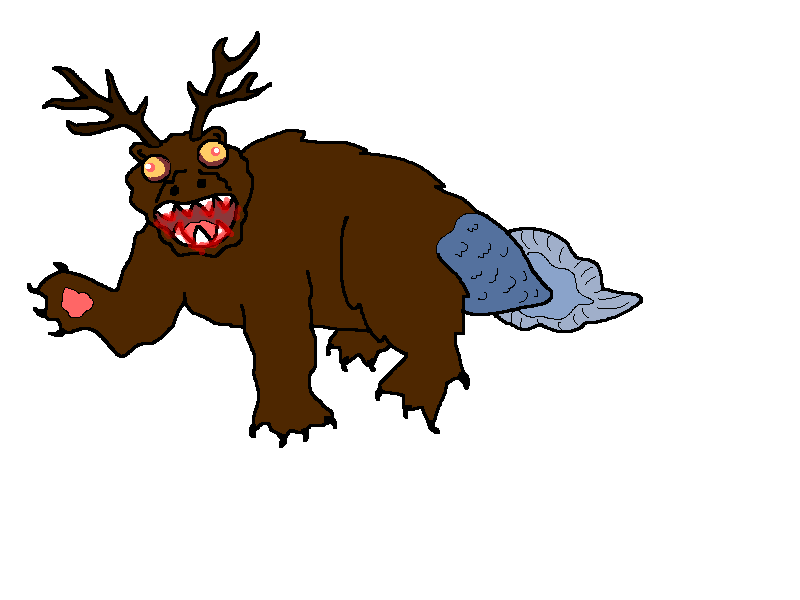 So here is my interpretation of what mutant zombie bears would probably look like, if the bear population ever mutates and contracts a rare virus that causes corpses to reanimate as brain-eating monsters. This one is capable of attacking by land or sea. If you manage to dodge his razor-sharp teeth, he'll just gore you with his antlers instead. He also enjoys sushi and long walks on the beach. You thought bears were fast when chasing prey on their four powerful legs? Now they can fly, too! Think twice about the popular "climb a tree" strategy. Actually, you shouldn't do that with a regular bear, either. They can all climb trees. If these guys catch you, you're pretty much screwed. But if you look on the bright side, your mauling will be over three times as fast. Also, if you're capable of any movement whatsoever, you have a distinct advantage, because running with that extra leg looks like it would be awkward. I think this is my "I've been posting every day for the past 9 days and I'm starting to go crazy" moment. But at least you get bears. Remind me if we ever do a sequel to our sweet little Herman the cat book, to add the mutant bears. Or maybe not. Something tells me it might not go so well with the 4-9 year old crowd. I just don't understand... is it the blood and giant fangs? ummmmmmmm...... no. it is the sharp claws. and the blood and giant fangs. I've seen mutant zombie bears. Your rendering is quite accurate. OH NO! Our days as humans must be numbered. they enjoy long walks on the beach and poetry. I love them! They need some tassels. Bahaha! Maybe some cute little hats and scarves. Just because you're a mutant zombie bear doesn't mean you can't look presentable. I always wondered, now I wonder no more! I now know what mutant zombie bears are! Thanks so much for stopping by my blog to say "hi." I think this is my favorite post of the day. I hope that if I ever come across one of these, that it's the first one. After we take a long walk on the beach, I can lure him to the edge of the cliff overlooking the beach using sushi, then throw it onto the rocks below. Hopefully, he will take the bait. Just make sure he lands on the rocks and not in the water. Otherwise he'll swim to safety and attack later. Ah, the power of social media. Making you follow through on a zombie bear post. Awesome.